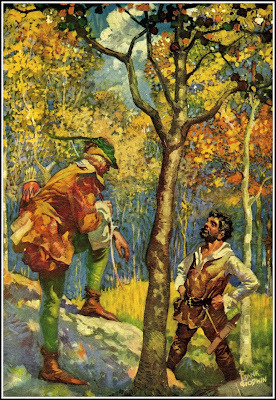 The Golden Age of Comic Book Illustration scanned Frank Godwin's illustrations from Robin Hood. It's very difficult to paint such colorful work without assaulting the viewer, but Godwin pulls it off with aplomb. Frank Godwin (October 20,1889-August 5,1959) was an American illustrator and comic strip artist. He was one of the top draftsmen of his day. His ink work with pen and brush was, in the opinion of many who are familiar with his work, superior to that of his better known contemporaries, such as Charles Dana Gibson, Howard Chandler Christy, and James Montgomery Flagg. He is best remembered for his book illustrations, which include those for Treasure Island, Kidnapped, Robinson Crusoe, and King Arthur.